Beth Moore’s book, “The Beloved Disciple”, is up for review due to her many claims of “God spoke to me“. These claims need to be examined due to the fact that when God gives commands to his church, it is authoritatively binding for the whole church, and equal with Scripture (2Peter 1:19-21, James 1:21-25). However, if God has not spoken to a person, who claims that God did speak to them, and told them to give commands to his church, then that person is guilty of taking the Lord’s name in vain by adding to the words of God to his church. I fought the traffic across Houston, then visited with my new friend and her husband while choking back the tears. They have two young sons, and unless God performs a miracle, their mother will go home to be with the Lord before they are grown. I got in my car and prayed. I pulled out of the parking garage, fighting the tears. A few blocks later as if on autopilot, I turned my steering wheel straight into the parking lot of the Houston Zoo! Christ seemed to say, “Let’s go play.” And that we did. I hadn’t been to the zoo in years. I heard about all the improvements, but I never expected the ultimate: Starbucks coffee! (OK, so I don’t have all my health issues down pat.) Can you imagine watching a baby koala take a nap in a tree on a rare cold day in Houston with a Starbucks grande cappuccino in your hand? Now that’s a Sabbath moment! God and I had a blast. Beth Moore’s god cannot be recognized as the God of Scripture, since nowhere in Scripture has the God of glory ever invited his servants to “go with him to play” (Psalm 29:3, Acts 7:2-3). Instead, he invites his people to delight themselves in him, which is done, not by focusing on the earthly affairs, and pleasures of this life, such as going to Starbucks, and enjoying a cup of cappuccino (1John 2:15-17, Jude 1:16-19). God’s instruction, from Scripture, is to delight one’s self in the Lord, by meditating on him, his word, his goodness, his loving kindness, his work of redemption…etc. which are Heavenly blessings, and not superficial, and earthly, as Beth Moore’s god is (Psalm 1:2-3, Psalm 34:8, Psalm 37:4, Psalm 118:1, Psalm 119:13-20, Romans 11:33-36, Ephesians 1:3, Ephesians 5:18-20, Colossians 15:17). God has given all things under Heaven for man’s enjoyment, but delighting oneself in the Lord should not be confused with earthly pleasures. Scripture does not direct the church to focus on delighting themselves in regular earthly pleasures, but on things that are above (Colossians 3:2). Furthermore, Christ’s commands to his church must come from the Bible, because “The Lord spoke to me…” is a breeding ground for heresy, and it is the foundation which cult leaders build on to take, from the church, a following after themselves. Therefore, to allow the church to be in the habit of listening to teachers who frequently make the claim of God speaking to them, and giving them commands for his church, which cannot be found in the Bible, is to tear down the wall of defense for the church that would have protected Christ’s sheep from deceivers, who cause divisions and offenses contrary to the gospel, and do not serve the Lord Jesus Christ, but their own belly; and by good words and fair speeches deceive the hearts of the simple (Romans 16:17-19). This is made evident by Beth Moore’s “vision of the church“, and her “acknowledgment of Roman Catholicism as just another Christian denomination“. 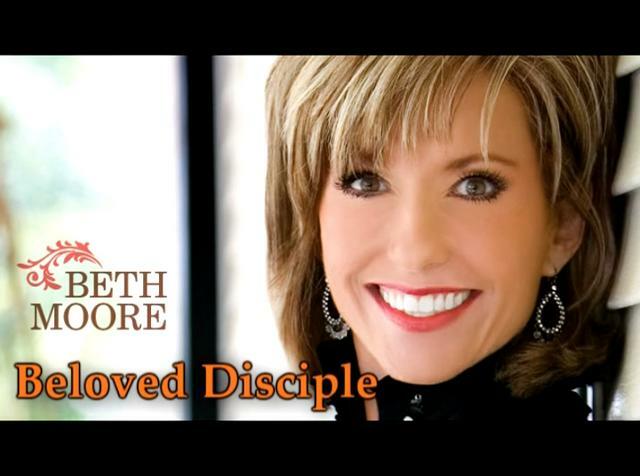 Therefore, teachers like Beth Moore must be marked, and avoided. This means that their books should not be read, and they must not be welcomed into the church as believers, because their authoritative commands, which, they claim, were given by divine revelation from God, cannot be affirmed by Scripture (2John 1:8-11). Christ gave his Apostles, and prophets, to the church for the purpose of building up his church in their knowledge of the gospel, until the New Testament was written by them. Now that the church has the New Testament, it no longer needs the presents of Apostles, and prophets. Nor does the church need the constant claims of God giving people visions, and extra-Biblical messages, because Scripture alone is sufficient to make the church wise for salvation through faith which is in Christ Jesus, and it was given by inspiration of God, and is profitable for doctrine, for reproof, for correction, for instruction in righteousness, so that the church may be complete, thoroughly equipped for every good work. (2Timothy 3:15-17). This is why it is said “whether there are prophecies, they will fail; whether there are tongues, they will cease; whether there is knowledge, it will vanish away. For we know in part and we prophesy in part. But when that which is perfect has come, then that which is in part will be done away. When I was a child, I spoke as a child, I understood as a child, I thought as a child; but when I became a man, I put away childish things. For now we see in a mirror, dimly, but then face to face. Now I know in part, but then I shall know just as I also am known” (1Corinthians 13:8-12). Therefore, the need for tongues, prophecy, and words of knowledge, were present because the church was still immature in it’s development. Now that the church has God’s written word, which is the mirror of the perfect law of liberty, they only need Scripture to instruct them in Christian living. The written word of God is the more reliable word of prophecy, because “no prophecy of Scripture is of any private interpretation, for prophecy never came by the will of man, but holy men of God spoke as they were moved by the Holy Spirit” (2Peter 1:19-21).